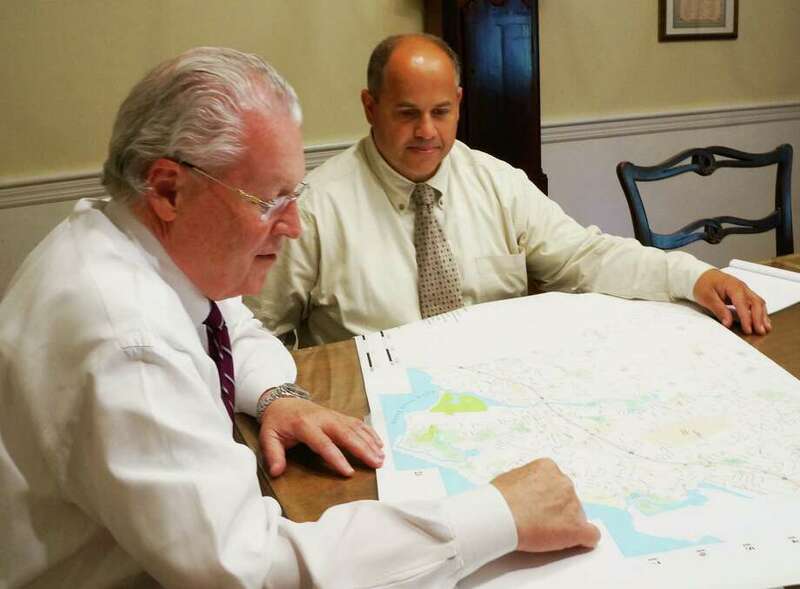 First Selectman Mike Tetreau, left, and Public Works Director Joseph Michelangelo look over a map of the beach neighborhoods. The town is exploring ways to prevent or minimize future storm flooding. It's a very large and constant reminder of the damage done as Superstorm Sandy surged across Fairfield's shoreline last Oct. 29, inundating the beach neighborhoods with a wind-whipped tidal surge. The recently rebuilt Penfield Pavilion, a glass-fronted jewel in the town's crown, was knocked a-kilter when the pounding water pushed the building off its pilings, causing walls and floors to buckle. A year later, chain-link fencing still surrounds the pavilion, off-limits to the public while town officials struggle with formulating a plan to repair it. Much like the homeowners living in the area, officials are still negotiating with the insurance company, trying to get a handle on just how much money their claim will provide, and what kind of reimbursement will be available from the Federal Emergency Management Agency. In any case, regardless of what kind of repair plan is approved and how much of the costs are covered by other sources, the overall price tag to reopen Penfield Pavilion is expected to be in the millions. Unlike homeowners, however, town officials aren't just dealing with one building -- they're taking a much wider look at how to prevent or minimize the kind of destruction that Sandy wrought for the whole town. That means looking at flood mitigation along the shore, while also getting the word out to property owners on grants and loans available to help them do the same for their small piece of Fairfield. It also means looking into ways to make some of the town's essential buildings -- like police and fire headquarters, the town garage and the sewage-treatment plant -- functional when the power is off. "From a standpoint of flood mitigation, there are two initiatives underway," First Selectman Michael Tetreau said. "The only silver lining coming out of (Superstorm) Sandy is it was such a significant event we got to see what worked and what didn't." The town's approach includes first fixing some infrastructure that failed. "Several of the floodgates didn't work as planned," Tetreau said. "One was broken, but we were able to get it closed. Unfortunately, because of the amount of water, we weren't able to get the equipment in to open it up after the storm." Drainage pipes and culverts that need to be repaired or replaced have been identified so they work efficiently in the future. The town is also working with the Greater Bridgeport Regional Planning Council on a hazard mitigation plan. "We've done a couple of workshops with about 30 stakeholders from the community; we've had a public session," Tetreau said. "The next step will be to sit down with town staff and kind of review the mitigation plan." Public hearings will take place once the mitigation plan is evaluated. "That forms the foundation for two very important initiatives," Tetreau said. "One is to qualify the town and residents for additional hazardous mitigation grants, and these are grant programs providing up to 75 percent of hazard mitigation improvements per house. This fund is not focused on providing money for those houses that were substantially destroyed." And the town continues to "harden" its infrastructure against future flooding. Tetreau and other town officials, including Public Works Director Joseph Michelangelo, recently toured the city of Stamford's dike system that includes pump stations. "We have a dike along Pine Creek," Tetreau said. "It protected 1,000 houses from flooding, and with rising sea levels we have to revisit that." This work, Tetreau said, becomes the foundation for the Community Rating System, which could allow residents to qualify flood insurance discounts. "That's really important with the new flood insurance rates; people are just starting to get those bills," he said. At one time, Michelangelo said, there was a barrier beach between the town and Long Island Sound. "That's been filled in now, but there are still low-lying houses," he said. "On a daily basis, twice a day, the tides enter through Pine Creek and Ash Creek, and that's by design." The water is regulated with the tide gates to prevent flooding of streets, while allowing water to enter and feed the marshes. The drainage system in the center of town empties into Pine and Ash creeks. "It's a gravity system and it's very old, shallow pipe," so during serious flooding, that outlet rate slows down significantly, Michelangelo said. And even though the neighborhood between the beach and the town center is above high-tide level, "it is still a bowl," he said. "When water gets in that area, it is trapped." Michelangelo said officials have had consultants review the installation of larger drainage pipes, like 60-inch, which is four times what the town has now. "We also need to get the water out," he said. As an example, he said, the gravity system used for the wastewater treatment plant is not technically complex. The drainage pipes are about 30 feet below ground and most of the water flows there through gravity. There is also a pump station, that can pump 25 million gallons a day. "It could be the same thing with storm drainage, if we had a similar-type system" to submerge those pipes deeper and at a better pitch, he said. "Once it gets to a low point, we could pump it out. That's some of the brainstorming we're doing." It wouldn't necessarily eliminate all the flooding problems, but it could help in getting water out of the area within, say, a 24-hour period, as opposed to several days of flooded streets, as was the case after Sandy, Michelangelo said. Keeping the water from getting into residential neighborhoods is another story, and while the idea might be welcomed by residents north of the beach and south of the Old Post Road, the execution might not be. "It is possible to protect property, but it would divide the beach community from the beach," Michelangelo said. There also is not a lot of beach where a barrier could be installed on the beach, he said. "The further we build it from Fairfield Beach Road, the less bulky it has to be," Michelangelo said. "One of the trade-offs is where do you put these things." "It's a densely populated area," Tetreau said, and no matter where a barrier might be built, there still would be some homes south of the dike that would not be protected from storm waters, much like in Stamford. But the $5.2 million in 20 different repair projects approved locally in Sandy's wake will help. "In just about all of these projects, there's mitigation built into the design," he said. "These 20 different projects don't address the flooding issue per se, but individual structures are built `harder' than their predecessors." Those projects include repairing the drainage and road base of Fairfield Beach Road from Reef Road to the cul-de-sac; re-establishing the channel in Southport Harbor; repairing the jetty that leads to the South Benson fishing pier; repairing the breakers and seawall at Southport Beach; re-establishing Pine Creek's channel and debris removal; repairs to the Fairfield Beach Road cul-de-sac seawall and bulkhead; and increasing the elevation of the Pine Creek dike. Flooding is not the only issue during severe storms, whether they are tropical storms, nor'easters or blizzards. Following Sandy and her predecessor, Tropical Storm Irene in 2011, power in some areas of town was out for a week or more. While it is up to United Illuminating to maintain its power-delivery system, the town is taking steps that will cut its reliance on UI for essential services. Under the guidance of Assistant Public Works Director Ed Boman, the town has developed a microgrid power system to ensure power keeps running at home base of critical municipal services, such as police and fire headquarters, paid for with a $1.2 million state grant. "With the microgrid, we can supply power on a day-to-day basis," Tetreau said, and the town is also making sure that local cell towers are tied in to that. "We saw in other towns the panic that ensues when cellphone power is shut off," he said. The $1.2 million grant will cover adding photovoltaic systems at fire headquarters and rewiring a diesel-fired emergency generator at the police headquarters. Underground connections between those departments and the Operation Hope homeless shelter would be installed. In addition, a 300-kilowatt energy fuel cell will be installed at the sewage-treatment plant, fueled by an existing on-site gas main. A 100-kilowatt reciprocating generator will be installed at the plant, using methane created by the digesters to provide electricity. An existing 800-kilowatt emergency generator will be converted to dual fuel and two other emergency generators will be reconfigured. A 1,000-kilowatt photovoltaic system will be installed on a section of the closed landfill and will be connected to the microgrid at the public works compound.